Scholars have attempted to reconstruct the phonology of Old Chinese from documentary evidence. Although the writing system does not describe sounds directly, shared phonetic components of the most ancient Chinese characters are believed to link words that were pronounced similarly at that time. The oldest surviving Chinese verse, in the Classic of Poetry (Shijing), shows which words rhymed in that period. Scholars have compared these bodies of contemporary evidence with the much later Middle Chinese pronunciations listed in the Qieyun rime dictionary published in 601 AD, though this falls short of a phonemic analysis. Supplementary evidence has been drawn from cognates in other Sino-Tibetan languages and in Min Chinese, which split off before the Middle Chinese period, Chinese transcriptions of foreign names, and early borrowings from and by neighbouring languages such as Hmong–Mien, Tai and Tocharian languages. Although many details are disputed, most recent reconstructions agree on the basic structure. It is generally agreed that Old Chinese differed from Middle Chinese in lacking retroflex and palatal obstruents but having initial consonant clusters of some sort, and in having voiceless sonorants. Most recent reconstructions also posit consonant clusters at the end of the syllable, developing into tone distinctions in Middle Chinese. Most scholars reconstruct clusters of *s- with other consonants, and possibly other clusters as well, but this area remains unsettled. an optional post-coda *-ʔ or *-s.
In such systems, Old Chinese has no tones; the rising and departing tones of Middle Chinese are treated as reflexes of the Old Chinese post-codas. The primary sources of evidence for the reconstruction of the Old Chinese initials are medieval rhyme dictionaries and phonetic clues in the Chinese script. The reconstruction of Old Chinese often starts from "Early Middle Chinese", the phonological system of the Qieyun, a rhyme dictionary published in 601, with many revisions and expansions over the following centuries. These dictionaries indicated pronunciation by dividing a syllable into an initial consonant and the rest, called the final. According to its preface, the Qieyun did not reflect a single contemporary dialect, but incorporated distinctions made in different parts of China at the time (a diasystem). Rhyme tables from the Song dynasty contain a sophisticated feature analysis of the Qieyun initials and finals, though not a full phonemic analysis. Moreover, they were influenced by the different pronunciations of that later period. Scholars have attempted to determine the phonetic content of the various distinctions by examining pronunciations in modern varieties and loans in Japanese, Korean and Vietnamese (the Sinoxenic materials), but many details regarding the finals are still disputed. By studying sound glosses given by Eastern Han authors, the Qing philologist Qian Daxin discovered that the Middle Chinese dental and retroflex stop series were not distinguished at that time. The resulting inventory of 32 initials (omitting the rare initial /ʐ/) is still used by some scholars within China, such as He Jiuying. Early in the 20th century, Huang Kan identified 19 Middle Chinese initials (shaded in the above table) that occurred with a wide range of finals, calling them the "basic initials of Old Chinese", and suggesting that the other initials were secondary developments. Although the Chinese writing system is not alphabetic, comparison of words whose characters share a phonetic element (a phonetic series) yields much information about pronunciation. Often the characters in a phonetic series are still pronounced alike, as in the character 中 (zhōng, 'middle'), which was adapted to write the words chōng ('pour', 沖) and zhōng ('loyal', 忠). In other cases the words in a phonetic series have very different sounds in any known variety of Chinese, but are assumed to have been similar at the time the characters were chosen. It is believed that the palatals arose from dentals and velars followed by an Old Chinese medial *-j-, unless the medial *-r- was also present. While all such dentals were palatalized, the conditions for palatalization of velars are only partly understood (see Medials below). This treatment of the Old Chinese liquids is further supported by Tibeto-Burman cognates and by transcription evidence. For example, the name of the city Alexandria was transcribed in the Book of Han as ⟨烏弋山離⟩, which is reconstructed as *ʔa-ljək-srjan-rjaj. Traces of the earlier liquids are also found in the divergent Waxiang dialect of western Hunan. Other cluster initials, including *s with stops or stops with *l, have been suggested but their existence and nature remains an open question. The Song dynasty rhyme tables classified Qieyun syllables as either "open" (律 kāi) or "closed" (合 hé), with the latter believed to indicate a medial -w- or lip rounding. This medial was unevenly distributed, being distinctive only after velar and laryngeal initials or before -ai, -an or -at. This is taken (following Sergei Yakhontov) to indicate that Old Chinese had labiovelar and labiolaryngeal initials but no labiovelar medial. The remaining occurrences of Middle Chinese -w- are believed to result from breaking of a back vowel before these codas (see Vowels below). As Middle Chinese g- occurs only in palatal environments, Li attempted to derive both g- and ɣ- from Old Chinese *ɡ-, but had to assume irregular developments in some cases. Li Rong showed that several words with Middle Chinese initial ɣ- were distinguished in modern Min dialects. For example, 厚 'thick' and 後 'after' were both ɣəu: in Middle Chinese, but have velar and zero initials respectively in several Min dialects. Most authors now assume both *ɡ- and *ɦ-, with subsequent lenition of *ɡ- in non-palatal environments. Similarly *w- is assumed as the labialized counterpart of *ɦ-. Pan Wuyun has proposed a revision of the above scheme to account for the fact that Middle Chinese glottal stop and laryngeal fricatives occurred together in phonetic series, unlike dental stops and fricatives, which were usually separated. Instead of the glottal stop initial *ʔ- and fricatives *h- and *ɦ-, he proposed uvular stops *q-, *qʰ- and *ɢ-, and similarly labio-uvular stops *qʷ-, *qʷʰ- and *ɢʷ- in place of *ʔʷ-, *hʷ- and *w-. Other points of articulation show similar distinctions within stops and nasals. Proto-Min voicing is inferred from the development of Min tones, but the phonetic values of the initials are otherwise uncertain. The sounds indicated as *-t, *-d, etc. are known as "softened stops" due to their reflexes in Jianyang and nearby Min varieties in northwestern Fujian, where they appear as fricatives or approximants (e.g. [v l h] < *-p *-t *-k in Jianyang) or are missing entirely, while the non-softened variants appear as stops. Evidence from early loans into Yao languages suggests that the softened stops were prenasalized. The most contentious aspect of the rhyme tables is their classification of the Qieyun finals into four divisions (等 děng). [lower-alpha 15] Most scholars believe that finals of divisions I and IV contained back and front vowels respectively. Division II is believed to represent retroflexion, and is traced back to the Old Chinese *-r- medial discussed above, while division III is usually taken as indicating a -j- medial. Since Karlgren, many scholars have projected this medial (but not -w-) back onto Old Chinese. The following table shows Baxter's account of the Old Chinese initials and medials leading to the combinations of initial and final types found in Early Middle Chinese. Baxter's account departs from the earlier reconstruction of Li Fang-Kuei in its treatment of *-j- and *-rj- after labial and guttural initials. Li proposed *Krj- as the source of palatal initials occurring in phonetic series with velars or laryngeals, found no evidence for *Prj-, and attributed the chongniu distinction to the vowel. Following proposals by Pulleyblank, Baxter explains chongniu using *-rj- and postulates that plain velars and laryngeals were palatalized when followed by both *-j- (but not *-rj-) and a front vowel. However a significant number of palatalizations are not explained by this rule. the presence or absence of a prefix. Jakhontov held that type B reflected a prefix *d-, while Ferlus suggested that type A arose from an unstressed prefix *Cə- (a minor syllable), which conditioned syllabic tenseness contrasting with laxness in type B syllables. a length distinction of the main vowel. Pulleyblank initially proposed that type B syllables had longer vowels, but Starostin and Zhengzhang later proposed long vowels for type A and short vowels for type B.
a prosodic distinction, as later proposed by Pulleyblank. pharyngealization of the initial consonant. Norman suggested that type B syllables (his class C), which comprised over half of the syllables of the Qieyun, were in fact unmarked in Old Chinese. Instead, he proposed that the remaining syllables were marked by retroflexion (the *-r- medial) or pharyngealization, either of which prevented palatalization in Middle Chinese. Baxter and Sagart have adopted a variant of this proposal, reconstructing pharyngealized initials in all type A syllables. A reconstruction of Old Chinese finals must explain the rhyming practice of the Shijing, a collection of songs and poetry from the 10th to 7th centuries BC. Again some of these songs still rhyme in modern varieties of Chinese, but many do not. This was attributed to lax rhyming practice until the late-Ming dynasty scholar Chen Di argued that a former consistency had been obscured by sound change. The systematic study of Old Chinese rhymes began in the 17th century, when Gu Yanwu divided the rhyming words of the Shijing into ten rhyme groups (韻部 yùnbù). These groups were subsequently refined by other scholars, culminating in a standard set of 31 in the 1930s. One of these scholars, Duan Yucai, stated the important principle that characters in the same phonetic series would be in the same rhyme group,[lower-alpha 17] making it possible to assign almost all words to rhyme groups. Assuming that rhyming syllables had the same main vowel, Li Fang-Kuei proposed a system of four vowels *i, *u, *ə and *ɡ. He also included three diphthongs *iə, *ia and *ua to account for syllables that were placed in rhyme groups reconstructed with *ə or *ɡ but were distinguished in Middle Chinese. In the late 1980s, Zhengzhang Shangfang, Sergei Starostin and William Baxter (following Nicholas Bodman) independently argued that these rhyme groups should be split, refining the 31 traditional rhyme groups into more than 50 groups corresponding to a six-vowel system. Baxter supported this thesis with a statistical analysis of the rhymes of the Shijing, though there were too few rhymes with codas *-p, *-m and *-kʷ to produce statistically significant results. The four tones of Middle Chinese were first described by Shen Yue around AD 500. They were the "level" (平 píng), "rising" (上 shǎng), "departing" (去 qù), and "entering" (入 rù) tones, with the last category consisting of the syllables ending in stops (-p, -t or -k). Although rhymes in the Shijing usually respect these tone categories, there are many cases of characters that are now pronounced with different tones rhyming together in the songs, mostly between the departing and entering tones. This led Duan Yucai to suggest that Old Chinese lacked the departing tone. Wang Niansun (1744 - 1832) and Jiang Yougao (d.1851) decided that the language had the same tones as Middle Chinese, but some words had later shifted between tones, a view that is still widely held among linguists in China. Karlgren also noted many cases where words in the departing and entering tones shared a phonetic element, e.g. He suggested that the departing tone words in such pairs had ended with a final voiced stop (*-d or *-ɡ) in Old Chinese. Being unwilling to split rhyme groups, Dong Tonghe and Li Fang-Kuei extended these final voiced stops to whole rhyme groups. The only exceptions were the 剌 and 祭 groups (Li's *-ar and *-ad), in which the traditional analysis already distinguished the syllables with entering tone contacts. The resulting scarcity of open syllables has been criticized on typological grounds. Wang Li preferred to reallocate words with connections to the entering tone to the corresponding entering tone group, proposing that the final stop was lost after a long vowel. Another perspective is provided by Haudricourt's demonstration that the tones of Vietnamese, which have a very similar structure to those of Middle Chinese, were derived from earlier final consonants. The Vietnamese counterparts of the rising and departing tones derived from a final glottal stop and *-s respectively, the latter developing to a glottal fricative *-h. These glottal post-codas respectively conditioned rising and falling pitch contours, which became distinctive when the post-codas were lost. Haudricourt suggested a similar derivation for the Chinese departing tone. The connection with stop finals would then be explained as syllables ending with *-ts or *-ks, with the stops later disappearing, allowing rhymes with open syllables. The absence of a corresponding labial final could be attributed to early assimilation of *-ps to *-ts. Pulleyblank supported the theory with several examples of syllables in the departing tone being used to transcribe foreign words ending in -s into Chinese, and also suggested that *-s acted as a derivational suffix. Pulleyblank took Haudricourt's suggestion to its logical conclusion, proposing that the Chinese rising tone had also arisen from a final glottal stop. Mei Tsu-lin supported this theory with evidence from early transcriptions of Sanskrit words, and pointed out that rising tone words end in a glottal stop in some modern Chinese dialects, e.g. Wenzhounese and some Min dialects. In addition, most of the entering tone words that rhyme with rising tone words in the Shijing end in -k.
Baxter also speculated on the possibility of a glottal stop occurring after oral stop finals. The evidence is limited, and consists mainly of contacts between rising tone syllables and -k finals, which could alternatively be explained as phonetic similarity. To account for phonetic series and rhymes in which MC -j alternates with -n, Sergei Starostin proposed that MC -n in such cases derived from Old Chinese *-r. Other scholars have suggested that such contacts are due to dialectal mixture, citing evidence that *-n had disappeared from eastern dialects by the Eastern Han period. ↑ Reconstructed Old Chinese forms are starred and follow Baxter (1992) with some graphical substitutions from his more recent work: *ə for *ɨ and consonants rendered according to IPA conventions. ↑ Baxter describes his reconstruction of the palatal initials as "especially tentative, being based largely on scanty graphic evidence". ↑ The rhyme tables describe a later stage in which labiodental fricatives were also distinguished. ↑ It is not clear whether these had an alveolar or dental articulation. They are mostly alveolar in modern Chinese varieties. ↑ The /ʐ/ initial occurs in only two words 俟 and 漦 in the Qieyun, and is merged with /dʐ/ in the later Guangyun. It is omitted in many reconstructions, and has no standard Chinese name. ↑ The retroflex and palatal sibilants were treated as a single series in the later rhyme tables. 1 2 The initials 禪 and 船 are reversed from their positions in the rhyme tables, which are believed to have confused them. 1 2 In the rhyme tables, the palatal allophone of /ɣ/ (云) is combined with /j/ (以) as a single initial 喻. ↑ The point of articulation of the fricatives is not clear, and varies between the modern varieties. ↑ In 1940, Karlgren published the first complete reconstruction of Old Chinese in a dictionary called the Grammata Serica, in which characters are arranged by phonetic series within rhyme groups. The 1957 revision Grammata Serica Recensa (GSR) remains a standard reference, even though Karlgren's reconstructions have been superseded by the work of later scholars such as Wang Li, E. G. Pulleyblank, Li Fang-Kuei and William Baxter. ↑ Middle Chinese forms are given in Li Fang-Kuei's revision of Karlgren's notation, with minor simplifications suggested by Coblin (1986), p. 9. ↑ Karlgren originally postulated Old Chinese consonant clusters with *-l- in such cases. ↑ Originally proposed as voiced and voiceless fricative initials in Pulleyblank (1962a), pp. 114–119. ↑ Baxter and Sagart derive the additional aspirated initials from consonant clusters and the softened stops from minor syllables. ↑ Finals of divisions I, II and IV occurred only in rows 1, 2 and 4 of the rhyme tables respectively, while division III finals occurred in rows 2, 3 or 4 depending on the initial. ↑ The precise nature of the chóngniǔ distinction in Middle Chinese is disputed. In their Middle Chinese reconstructions, Li and Baxter distinguish them by using -ji- as a purely notational device for III-4. ↑ 同聲必同部 Tóng shēng bì tóng bù. ↑ Each rhyme group was named after one of the corresponding Guangyun rhymes, with the choice sometimes varying between authors. ↑ The 祭 group included departing tone words only. ↑ Chinese: “四聲之辯，古人未有。” in Chen Di (1541–1617), Máo Shī Gǔ Yīn Kǎo 《毛詩古音考》, quoted in Wang (1985), p. 72. ↑ Schuessler (2009), p. x. ↑ Li (1974–75), p. 237. ↑ Norman (1988), p. 46. ↑ Baxter (1992), pp. 188–215. ↑ Schuessler (2007), p. 122. ↑ Baxter (1992), p. 203. ↑ Baxter (1992), pp. 222–232. ↑ Baxter (1992), pp. 178–185. ↑ Baxter (1992), pp. 32–44. ↑ Norman (1988), pp. 24–42. ↑ Baxter (1992), pp. 45–59. 1 2 Zhengzhang (2000), pp. 12–13. ↑ Baxter (1992), pp. 46–49. ↑ Baxter (1992), p. 49. ↑ Baxter (1992), pp. 56–57, 206. ↑ Baxter (1992), pp. 54–55. ↑ Baxter (1992), pp. 52–54. ↑ Baxter (1992), pp. 55–56, 59. ↑ Baxter (1992), p. 58. ↑ Norman (1988), p. 44. ↑ Dong (2014), pp. 33–35. ↑ He (1991), pp. 69–75. ↑ Norman (1988), pp. 43–44. ↑ Li (1974–75), pp. 228–232. ↑ Baxter (1992), pp. 191–196, 203–206. ↑ Schuessler (2009), p. ix. ↑ Li (1974–75), pp. 224–227. ↑ Baxter (1992), pp. 192–193. ↑ Baxter (1992), p. 211. ↑ Baxter (1992), pp. 193–194, 210–214, 569–570. ↑ Li (1974–75), pp. 240–241. ↑ Baxter (1992), pp. 199–202. ↑ Pulleyblank (1962a), pp. 110–111. ↑ Baxter (1992), pp. 280, 775. ↑ Baxter (1992), p. 201. ↑ Baxter (1992), p. 197. ↑ Zhengzhang (2000), p. 15. ↑ Baxter (1992), pp. 795, 802, 785, 773. ↑ Baxter & Sagart (2014), pp. 109–110. ↑ Pulleyblank (1962a), p. 92. ↑ Baxter (1992), p. 189. ↑ Baxter (1992), p. 193. ↑ Baxter (1992), p. 208. ↑ Baxter (1992), p. 222. ↑ Li (1974–75), pp. 241–243. ↑ Baxter (1992), pp. 227–234. ↑ Norman (1988), p. 32. ↑ Li (1974–75), pp. 233–234. ↑ Baxter (1992), p. 180. ↑ Baxter (1992), pp. 209–210. ↑ Zhengzhang (2000), pp. 13–14. ↑ Zhengzhang (2000), pp. 14–15. ↑ Norman (1973), pp. 227, 230, 233, 235. ↑ Norman (1988), pp. 228–229. ↑ Norman (1986), p. 381. ↑ Baxter (1992), pp. 187, 219–220. ↑ Baxter & Sagart (2014), pp. 91–93. ↑ Baxter (1992), pp. 64, 66, 67, 69. ↑ Norman (1988), pp. 32, 36–38. ↑ Baxter (1992), pp. 64–81. 1 2 Handel (2003), p. 555. ↑ Baxter (1992), pp. 235–290. ↑ Baxter (1992), pp. 63, 75–79, 282–287. ↑ Li (1974–75), p. 224. ↑ Baxter (1992), p. 63. ↑ Pulleyblank (1962a), pp. 98–107. ↑ Baxter (1992), pp. 210–214, 280. ↑ Baxter (1992), pp. 287–290. ↑ Norman (1994), pp. 400–402. ↑ Pulleyblank (1977–78), pp. 183–185. 1 2 Norman (1994), p. 400. ↑ Schuessler (2007), p. 95. ↑ Baxter (1992), p. 288. ↑ Ferlus (2001), pp. 305–307. 1 2 Pulleyblank (1992), p. 379. ↑ Handel (2003), p. 550. ↑ Zhengzhang (1991), pp. 160–161. ↑ Zhengzhang (2000), pp. 48–57. ↑ Baxter & Sagart (2014), pp. 43, 68–76. ↑ Baxter (1992), p. 831. ↑ Baxter (1992), pp. 150–170. ↑ Norman (1988), pp. 42–44. ↑ Li (1974–75), pp. 243–247. ↑ Zhengzhang (2000), pp. 42–43. ↑ Starostin (1989), pp. 343–429. ↑ Bodman (1980), p. 47. ↑ Baxter (1992), pp. 180, 253–254, 813. ↑ Baxter (1992), pp. 560–562. ↑ Tabulation of rhyme groups from Pulleyblank (1977–78), p. 181 and Norman (1988), p. 48. Data from Baxter (1992), pp. 141–150, 170, 243–246, 254–255, 298–302 and Li (1974–75), pp. 252–279. ↑ Baxter (1992), p. 141. ↑ Baxter (1992), p. 389. ↑ Baxter (1992), p. 303. ↑ Baxter (1992), pp. 304–305. ↑ Wang (1985), pp. 72–77. ↑ Karlgren (1923), pp. 27–30. ↑ Baxter (1992), pp. 331–333. ↑ Baxter (1992), pp. 340–342. ↑ Baxter (1992), pp. 308–317. ↑ Norman (1988), pp. 54–57. ↑ Pulleyblank (1962b), pp. 216–224. ↑ Pulleyblank (1962b), pp. 225–227. ↑ Baxter (1992), p. 322. ↑ Baxter (1992), pp. 181–183. ↑ Baxter (1992), pp. 323–324. ↑ Baxter (1992), p. 843. ↑ Baxter (1992), pp. 294–297. —— (2006), "Eulogy: Sergej Anatol'evič Starostin" (PDF), Journal of Chinese Linguistics, 34 (1): 164–166. Coblin, W. South (1986), A Sinologist's Handlist of Sino-Tibetan Lexical Comparisons, Monumenta Serica monograph series, 18, Steyler Verlag, ISBN 978-3-87787-208-6. Dong, Hongyuan (2014), A History of the Chinese Language, Routledge, ISBN 978-1-317-74389-7. Ferlus, Michel (2001), "The Origin of Tones in Viet–Muong", in Burusphat, Somsonge, Eleventh Annual Meeting of the Southeast Asian Linguistic Society (PDF), Arizona State University, pp. 297–313, ISBN 978-1-881044-34-5. Handel, Zev J. (2003), "Appendix A: A Concise Introduction to Old Chinese Phonology", in Matisoff, James, Handbook of Proto-Tibeto-Burman: System and Philosophy of Sino-Tibetan Reconstruction, Berkeley: University of California Press, pp. 543–576, ISBN 978-0-520-09843-5. He, Jiuying (1991), Shànggǔ Yīn 上古音, Hànyǔ Zhīshì Cóngshū 《汉语知识丛书》 (in Chinese), Beijing: Shāngwù Yìnshūguǎn Chūbǎn, ISBN 978-7-100-00072-7. Karlgren, Bernhard (1923), Analytic dictionary of Chinese and Sino-Japanese, Paris: Paul Geuthner, ISBN 978-0-486-21887-8. —— (1957), Grammata Serica Recensa, Stockholm: Museum of Far Eastern Antiquities, OCLC 1999753. Li, Fang-Kuei (1974–75), translated by Gilbert L. Mattos, "Studies on Archaic Chinese", Monumenta Serica, 31: 219–287, JSTOR 40726172. Mei, Tsu-lin (1970), "Tones and prosody in Middle Chinese and the origin of the rising tone" (PDF), Harvard Journal of Asiatic Studies, 30: 86–110, doi:10.2307/2718766, JSTOR 2718766. Norman, Jerry (1973), "Tonal development in Min", Journal of Chinese Linguistics, 1 (2): 222–238. —— (1986), "The origin of Proto-Min softened stops", in McCoy, John; Light, Timothy, Contributions to Sino-Tibetan studies, Leiden: E. J. Brill, pp. 375–384, ISBN 978-90-04-07850-5. —— (1988), Chinese, Cambridge: Cambridge University Press, ISBN 978-0-521-29653-3. —— (1994), "Pharyngealization in Early Chinese", Journal of the American Oriental Society, 114 (3): 397–408, doi:10.2307/605083, JSTOR 605083. Pulleyblank, Edwin G. (1962a), "The Consonantal System of Old Chinese" (PDF), Asia Major, 9: 58–144. —— (1962b), "The Consonantal System of Old Chinese, part 2" (PDF), Asia Major, 9: 206–265. —— (1977–78), "The final consonants of Old Chinese", Monumenta Serica, 33: 180–206, JSTOR 40726239. —— (1992), "How do we reconstruct Old Chinese? ", Journal of the American Oriental Society, 112 (3): 365–382, doi:10.2307/603076, JSTOR 603076. Sagart, Laurent (2007), "Reconstructing Old Chinese uvulars in the Baxter-Sagart system" (PDF), 40th International Conference on Sino-Tibetan Languages and Linguistics. —— (2009), Minimal Old Chinese and Later Han Chinese: A Companion to Grammata Serica Recensa, Honolulu: University of Hawaii Press, ISBN 978-0-8248-3264-3. Starostin, Sergei A. (1989), Rekonstrukcija drevnekitajskoj fonologičeskoj sistemy [Reconstruction of the Phonological System of Old Chinese] (PDF) (in Russian), Moscow: Nauka, ISBN 978-5-02-016986-9. Wang, Li (1985), Hànyǔ Yǔyīn Shǐ 汉语语音史 [History of Chinese Phonetics] (in Chinese), Beijing: China Social Sciences Press, ISBN 978-7-100-05390-7. Reprinted by Shāngwù Yìnshūguǎn Chūbǎn, Beijing in 2008, ISBN 978-7-100-05390-7. 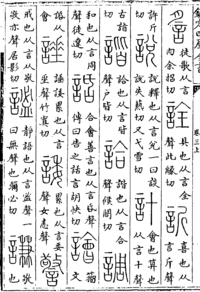 Zhengzhang, Shangfang (1991), "Decipherment of Yue-Ren-Ge (Song of the Yue boatman)", Cahiers de Linguistique Asie Orientale, 20 (2): 159–168, doi:10.3406/clao.1991.1345. —— (2000), The Phonological system of Old Chinese, translated by Laurent Sagart, Paris: École des Hautes Études en Sciences Sociales, ISBN 978-2-910216-04-7. Sagart, Laurent (1999), The Roots of Old Chinese, Amsterdam: John Benjamins, ISBN 978-90-272-3690-6. Yakhontov, S.E. (1965), Drevnekitajskij jazyk [Old Chinese] (PDF) (in Russian), Moscow: Nauka. —— (1978–79), translated by Jerry Norman, "Old Chinese Phonology" (PDF), Early China, 5: 37–40. Translation of Chapter 2 (Phonetics) of Yakhontov (1965). Zhengzhang, Shangfang (2003), Shànggǔ Yīnxì 上古音系 [Old Chinese Phonology] (in Chinese), Shanghai: Shànghǎi Jiàoyù Chūbǎn Shè, ISBN 978-7-5320-9244-4. "Introduction to Chinese Historical Phonology", Guillaume Jacques, European Association of Chinese Linguistics Spring School in Chinese Linguistics, International Institute for Asian Studies, Leiden, March 2006. "Summer School on Old Chinese Phonology" (videos), William Baxter and Laurent Sagart, École des Hautes Études en Sciences Sociales, Paris, July 2007. StarLing database, by Georgiy Starostin. The Baxter-Sagart reconstruction of Old Chinese. 上古音查询 ("Ancient sound query", in Chinese), by Pan Wuyun.